Everything from tree roots to leaves play a role in keeping our water in lakes, rivers, and aquifers clean. This is important because 75 percent of Minnesotans get their drinking water from the forested parts of the state. 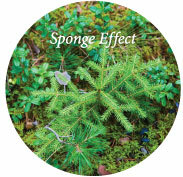 Forests act like an umbrella, filter, and sponge to keep water clean. 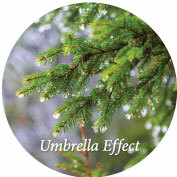 Trees and understory plants slow down and guide rain as it falls to the ground. This umbrella effect prevents soil from washing away into lakes and streams. Plus, it lets water seep deep to replenish groundwater in aquifers. The large and numerous pore spaces in forest soils trap sediment, nutrients, and pollutants suspended in rainwater. 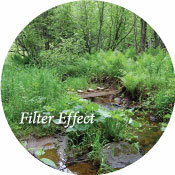 This filter effect prevents contaminants from entering ground and surface waters. The pore spaces that filter contaminants also soak up and store rainwater and snowmelt like a big sponge. Over time, the forest soil slowly releases water and helps keep soil in place, reducing flooding and erosion. Celebrate Arbor Month by planting a tree or two in your yard to provide clean water for generations to come. Our Planting Trees and Seedlings webpage features a helpful videos and instructions on how to plant trees. Our Tree Care and Pruning webpage features videos and tips on how to water a newly planted tree and how to mulch a tree. Retaining and managing forests is one of the best ways to protect drinking water and reduce the cost of water treatment. About three-quarters of Minnesotans get their drinking water from the forested parts of the state. Sound management of forested public lands surrounding the Mississippi River ensures clean drinking water for more than 1 million Minnesotans. Urban trees decrease water entering storm sewers by capturing rain, increasing flow of water into the soil, and transpiring water into the air. 1. Ernst, Caryn. (2004). Protecting the source. Land conservation and the future of America's drinking water. The Trust for Public Lands and the American Water Works Association. 2. Purdue Extension Safe Water Office. Land use and water quality. Accessed 2/23/2015. Funding provided by a grant from the USDA Forest Service. This institution is an equal opportunity provider.